Jeff Austin (member of Rail Heritage WA and co‐author of Rails Through the Bush) has written a book detailing another aspect of the railway history of Western Australia. This one is called Station Masters of Western Australia and is certainly a definitive review of the subject. Image: Cover picture from Station Masters of Western Australia. The station personnel at North Fremantle c1899. 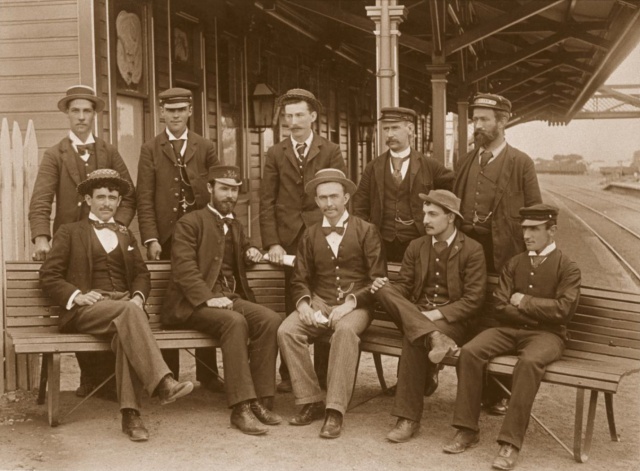 The Station master, Mr E.H. Hickey, is seated second from our left. The others would be mainly clerks, porters, signalmen or shunters. State Library WA 28673P. This entry was posted in Rail Heritage by Ross. Bookmark the permalink. I am trying to find out some history of my great grandfather, Alexander Cowie, who was a stationmaster at Southern Cross in 1899. Does your book have any references to him or any information about his time at Southern Cross? Best of luck tracking down your great grandfather! It would be great to find its home. Best of luck with returning the photo to their family.